Dear Ellen: How will (Canadian) credit unions be effected during the next financial crisis? Are credit unions ‘somehow’ public banks? Credit unions in Canada are ensured by CDIC insurance. See http://www.cdic.ca/WhereInsured/Pages/default.aspx . If you have deposits in chequing or savings accounts these deposits are insured for up to $100,000. Credit unions are considered more public than the Big 6 in Canada because they do not take deposits directly from the Bank of Canada, and credit unions distribute profits among its members / account holders. MONEY out of banks into CREDIT UNIONS…. A credit union is a member-owned financial cooperative, democratically controlled by its members, and operated for the purpose of promoting thrift, providing credit at competitive rates, and providing other financial services to its members. So why would someone not invest in the credit union instead of the public bank suggested? I second Gerry’s question. What measures are necessary to move Credit Unions towards fulfilling the ideal of Public Banking? Convincing the public to participate would be far easier. If credit unions are already member-owned financial cooperatives, democratically controlled by its members, there is no reason to move Credit Unions in any direction at all. Check out a credit union near you. Then move your money out of the banks into CREDIT UNIONS. We can’t wait for the government to do the right thing. the only thing i fouind was that credit unions are more dinosaur than commercial banks. Staffed by dumber than average people with more onerous interpretations of ordinary rules. I liked your Why do banks want your deposits? But you fail to mention the increased debt that has to be created (in the bank’s books) as owed by the receiver of each newly issued bank loan. Proper consolidation accounting would show this for personal transactions, for individual national economies and for the world as a whole. This is more a question than a comment. 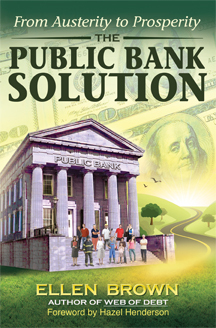 Do public banks engage in fractional reserve banking? As i understand things, this essentially is fiat money are better stated “currency” created out of nothing according to Edward Griffin in his “The Creature from Jekyll Island.”. what banks or credit unions will survive the comming financial crash, and should we move out of the mainstream banks to a smaller institution? If so, which ones….Calif?? In Alberta Canada the provincial government owns the Alberta Treasury Branch bank. Is my money safer in this bank because the Alberta Government owns it? The solution is not shown here, so I will show the unknown problem, then the solution. The central banks do not want a total collapse, as this would not bring about the announced new world order one world everything they say they want.. What is being created, is the move to the cashless society as the west will be the last to hit the wall. Lessor currencies will see their economies destroyed when the west so much as get a cold. Bailing in …could not possibly pay off the impossible global unnecessary debt deliberately created by fiat fractional reserve usery. For those unaware, the math code for all contracts trusts and treaties now used over the last 8,500 yeas in 5,000 languages globally, has been broken. This means the global economic system operated under the law of the admiralty, the law of fiction, will face a CHANGEOVER. Any lawyer such as our gracious host already understands the basics of language in articling. All legal language uses adverb verb..The world of fiction and the world of fact however will never meet. One can understand then, that all documents of contract trust and treaty, is void and rendered unenforcable, requiring them to be rewritten using proper syntax. This skill pays up to $1,000.00 per hour. There is only one man on the planet capable of writing in Quantum..
Look at the US one dollar.bill. See the word AMERICA on it. Any Canadian like me can easily find one at any bank or credit union if you want to bother.Take my word for it…the word is on there. MERI , is Latin for MERCY. CA,, is also Latin meaning SHEEP. Profound ! Obviously it’s a little late to blame our grade five english teacher, but the world communicates at a grade two level..Not exactly some conspiracy theory here dear readers. What has been shown to you, is merely an example of the QUANTUM parse syntax grammar mathematics code interface. The math functions perfectly forwards and backwards to ensure exact meaning with no room for misinterpretation. Such will be used in all future contracts, trusts and treaties. The excuse used will be another issue, but it’s enough to say people don’t go to court or to war over a math problem.. The interface is for proper operations designed to function in unison with the QUANTUM cray five supercomputer array, located beneath Falcon Colorado. These systems are connected to all data bases and communications centers globally. This provides the means for total monitoring for all economic activity on the planet .Governments of nations each monitor all communications of a different government and share information to get around the law. The tie-in to the cashless society, for those who will accept this for physical survival, is the biometric authentication RFID, in order to buy and sell. Welcome to the world’s first credit based, L.B.M.A. certified VAULTED gold backed currency ! The framework already exists in 119 countries as a savings network or group if you will. Denominations are suitable for low budget exchange & savings, and for online commerce. Storage is free until the person takes physical delivery. The currency is sealed with a serial number inside for double security. Now there are online vendors beginning to apply for acceptance to the refiner as a stable method of payment for buying and selling,. to maintain commerce as fiat paper begins to slowly dissolve. An unbreakable non prime number encryption is used for a third level of security on line. NO BIOMETRICS RFID. Further, those visionaries with interests in business development can share this with others, interested in physical and spiritual survival.Pay is every Friday in gold, and can be placed on to your credit card. I dare anyone to look for a loophole in this, because there isn’t one. How would I know ? I discovered this about a month before one I listen too announced he was already involved and making application as an online vendor. He has over a 200 I Q which helps. My background includes being a Canadian veteran of ten years including military intelligence…yes I have been underground, finance, a failed stripmine capitalization attempt, and an energy expert specializing in large volume buy / sell contracts with the lowest rates available. For further information, email techresult@hotmail.com Title it, Gold Currency.. I see what you mean….it does. However, perhaps you could get the book as it must have great information people can use. if it’s the solution anyone is looking for, perhaps our good host will allow you to connect to my obscure blog to explain these solutions with somewhat more depth than the comments made. Besides, people that want to be able to buy or sell in the future, will either take the mark, or avoid it’s biometric authentication by the RFID, and do buying and selling in the parallel economy sure to grow with all the online businesses that have begun to apply for this global standard of gold quality and in a secure method everyone can trust.